3 Days until Christmas!! I don’t know if I’m excited or just hysteric at this point. Anyone else feel that way? To sweeten up the realization of this countdown, we have one final holiday recipe for you and this is one for the books. 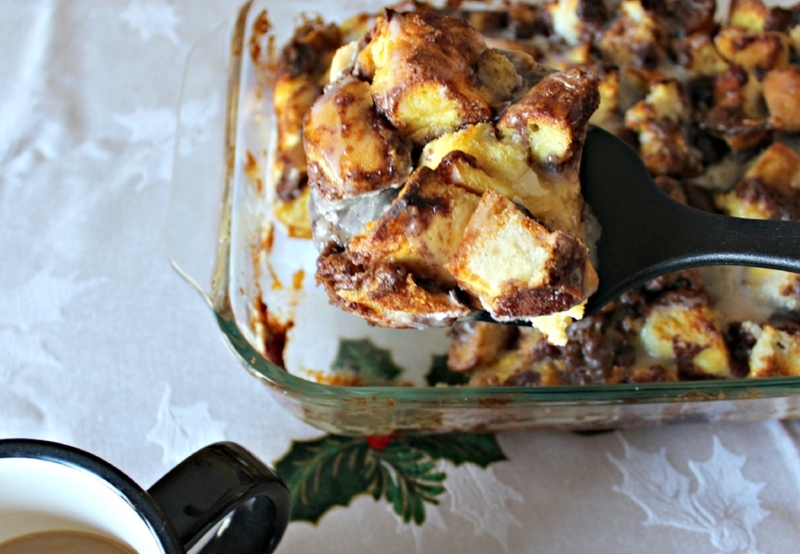 You may have seen several French Toast casseroles around these parts before. It’s because they’re so easy and so good! 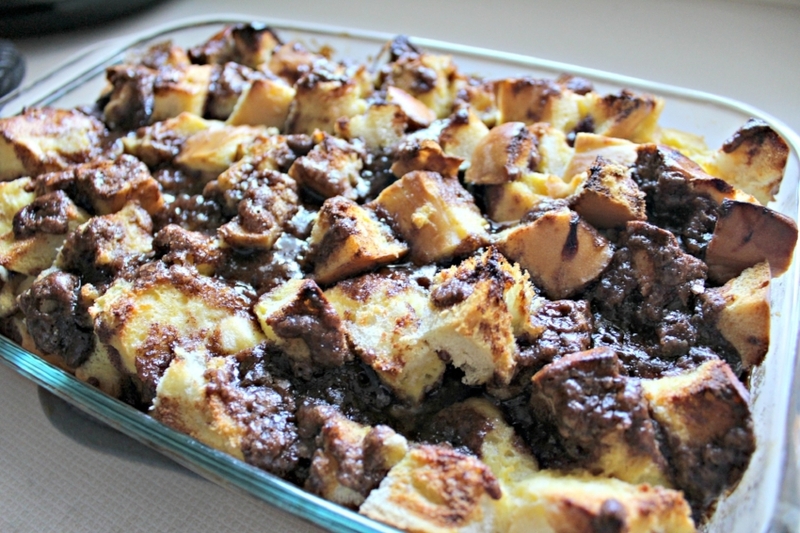 This one, a Cinnamon Roll French Toast Bake, is quite possibly the best one yet. Who doesn’t love cinnamon rolls? Who doesn’t love to make them? Yeah, me too. This recipe preps the night before and finishes in the morning. It’s easy and tastes just like a cinnamon roll. Everyone will be begging for seconds. Start like you would with any other casserole. 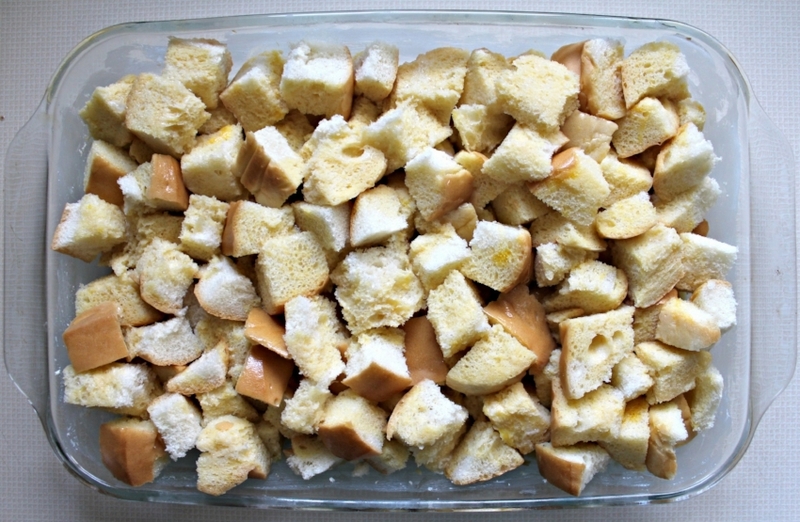 Butter a baking dish or spray it with cooking spray, fill with bread cubes and pour the egg mixture evenly throughout the entire dish. Cover with plastic wrap and pop in the fridge to chill overnight. The next morning, mix up the cinnamon mixture and evenly pour over the casserole. 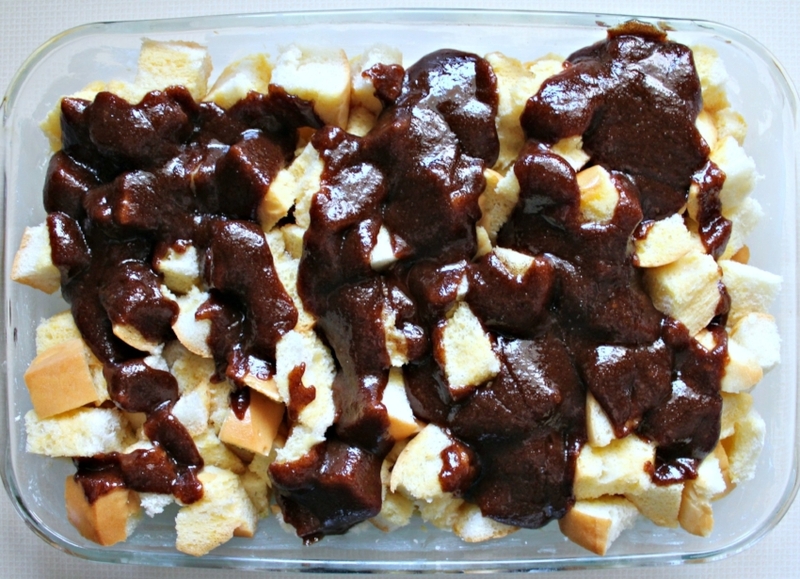 You could leave it as is but I wanted the cinnamon mixture to incorporate throughout the casserole as much as possible. 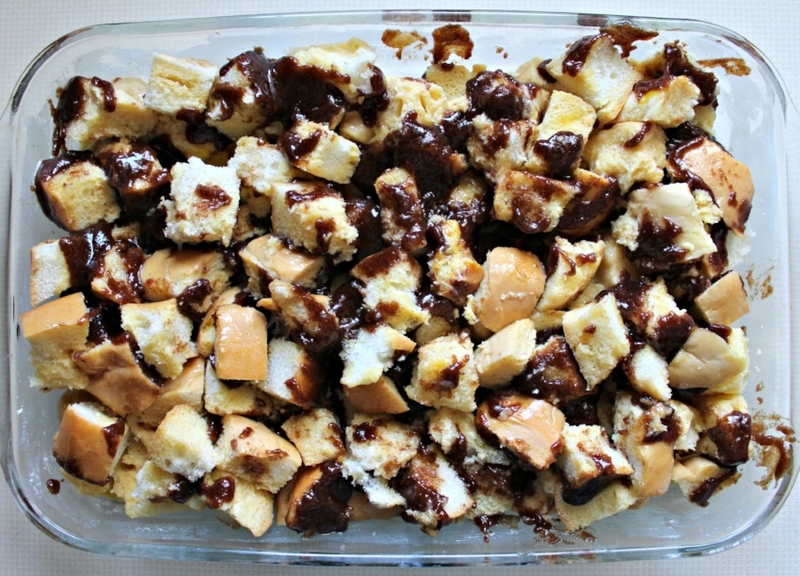 If you want to do the same, grab two forks or a spatula and toss the bread cubes to move the cinnamon mixture around. Bake in the oven covered at first and finish uncovered. It’s important to keep the top from burning before the rest of the casserole is cooked through. If you’d like, you can top it with a simple glaze. If not, just leave it as is. It sure is sweet enough without it! Obviously, this isn’t a breakfast you’d want to have every day of the week but it’s a nice treat for the holiday. Pair it with a nice fruit salad, some sausages or bacon and a glass of fresh squeezed orange juice...or in my case, a hot steaming mug of coffee. I will actually be bringing this baby back to life on Christmas morning in a few days! This will be the last recipe for a bit as we take a holiday break. In the meantime, I hope these recipes the last few weeks have inspired your own holiday cooking and that you have a wonderful weekend with friends, family and lots of great food. See you in 2018! 1 - Grease a 9x13 inch baking dish with butter or cooking spray. Evenly add the bread throughout the dish. 2 - In a large bowl, whisk together the eggs, milk, ¼ cup of brown sugar, and vanilla. Pour evenly over the bread and cover with plastic wrap. Set in the fridge overnight. 3 - Preheat the oven to 350 degrees. Remove the casserole from the fridge. In a small bowl, mix together the butter, 1 cup of brown sugar, cinnamon and flour. Drizzle all over the casserole so that the cinnamon mixture coast the bread on top pretty well. Gently use two forks or a spatula to toss the bread and cinnamon mixture together to even it out a bit. 4 - Bake uncovered with tin foil for 15 minutes. Remove the foil and finish baking 25-30 minutes. Let sit for 10 minutes before serving. 5 - (optional) Mix together the powdered sugar, milk and vanilla until smooth. Drizzle over the top of the casserole for a sweet, frosted finish.